Pre-order your copy now on Amazon or Barnes and Noble! From breakfast recipes that set a laid-back pace for the day ahead to dinner favorites like Margaritaville’s signature Cheeseburger in Paradise® and Seared Grouper with Mango Salsa, to side dishes like Lobster Hash Browns with Jalapeno Cheese, and fun desserts like Baked Florida, MARGARITAVILLE: The Cookbook features an array of appetizers, soups, salads, burgers, sandwiches, main dishes, sides, and dessert recipes fit for any taste at any latitude and time of day. And, because it’s always 5 o’Clock Somewhere, the cookbook is of course complete with recipes for the perfect cocktail, including Jimmy’s Perfect Margarita, Paradise Palomas and more. Chef Carlo Sernaglia has a deep understanding of Margaritaville’s most famous signature dishes. With a law degree in one hand and a lionfish spear in the other, he chose to follow his heart to the ocean and ultimately, to the kitchen. His passion for cooking took him through Italy, Venezuela and Florida before arriving on the shores of Margaritaville, where he uses his appetite for fresh ingredients and bold flavors to provide memorable meals. 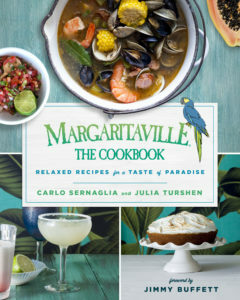 In MARGARITAVILLE: The Cookbook, Carlo teams up with accomplished food writer Julia Turshen to bring recipes from Margaritaville into kitchens across the world. The combination of recipes, stories, and gorgeous full color food and lifestyle photography throughout, is sure to put home cooks in a Margaritaville state of mind. With more than 60 food and beverage locations worldwide – and concepts including Margaritaville restaurant, 5 o’Clock Somewhere Bar & Grill, LandShark Bar & Grill and award-winning JWB Prime Steak & Seafood – Margaritaville celebrates the flavors of island life and provides a taste of paradise. Julia Turshen is the author of Feed the Resistance and Small Victories, named one of the Best Cookbooks of Fall 2016 by The New York Times. She has written for Vogue, Bon Appétit, Food & Wine, Saveur, SELF, The Washington Post, T Magazine and The Wall Street Journal. She lives in upstate New York with her wife, dogs, and cat. Pre-order your copy now on Amazon, Barnes and Noble, iBooks, Kindle or Indie Bound. World publishing rights for MARGARITAVILLE: The Cookbook were acquired by Macmillan Executive Vice President Will Schwalbe and St. Martin’s Press Senior Editor BJ Berti from Kari Stuart and Esther Newberg at ICM Partners.